Online Continuing Education Courses Available from UC IPM - FREE!! If you find yourself needing a few continuing education units (CEUs) to renew your DPR QAL, QAC, or PCA license as the year draws to a close, take UC IPM’s online courses on pesticide application methods and preventing pesticide runoff in urban areas for landscape and structural pest management professionals. These courses are free. Pesticide Application Equipment and Calibration givesan overview of many types of pesticide application equipment and provides a step-by-step approach to calibrating each to help you apply the correct amount of pesticide to a treatment area. Included are modules on calibrating liquid application equipment, calibrating dry application equipment, dealing with active ingredient and percentage solutions, and determining rates for soil injection and drenching and tree injection. This course has been approved for 1.5 CE units from DPR in the “Other” category. 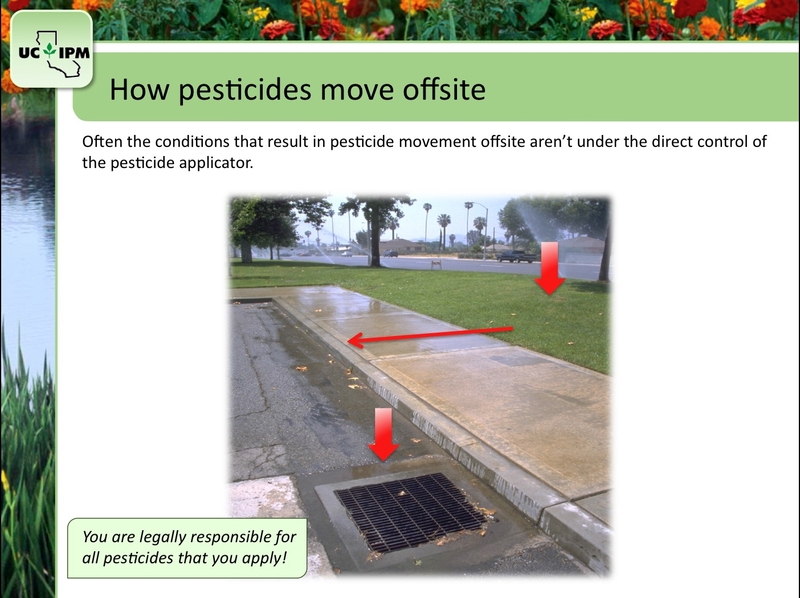 Urban Pesticide Runoff and Mitigation contains several modules grouped into four components, each available for 1 “Other” CE credit. IPM – A Solution for Reducing Pesticides/Water Quality: Pesticide Properties teaches basic IPM principles, discusses when a pesticide is really necessary, and explains the various properties of pesticides and how they influence pesticide movement in the environment.The Impact of Pesticides on Water Quality/Mitigating Urban Pesticide Runoff goes through the different ways pesticides get into our waterways and gives practical steps in reducing pesticide movement from the site of application. Water Quality and Mitigation: Bifenthrin and Fipronil teaches about two important insecticides that are being detected in California waterways and gives some practical solutions for reducing their movement or mitigating their effects. Herbicides and Water Quality provides general information about herbicides – how they are classified, how they work, and what properties affect runoff and leaching. 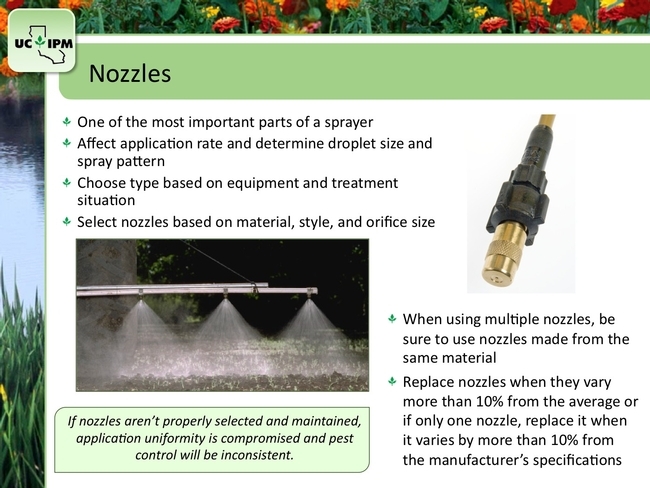 The module draws attention to several herbicides commonly detected in urban waterways, lists steps to choose the best herbicide for a given situation, and gives practical solutions for reducing herbicide use. Also discussed are alternative weed management methods and tips on applying herbicides in a way that minimizes runoff and leaching while protecting water quality. Each of these courses is narrated and features numerous color photographs and drawings to illustrate key concepts. Quizzes throughout the narrated modules reinforce learning. Users must view all screens in each module and pass a final online test before receiving a certificate of completion. Handouts highlighting the key points of each course, including example calculations for the calibration course, are also available on the UC IPM Web site. For more information about these courses and other pest management information, visit the UC IPM web site. Follow directions at bottom of page. DO NOT USE Internet Explorer. Use another browser like Chrome, Safari, Foxfire. Please follow the directions in the post above and in the comments. How long does it take for completed hours to get put onto the CAPCA CE log? That's up to CAPCA and the organization that DPR contracts with. My experience is that it is less than a month. Need hours to renew my QAC how can I get some hours? Does anyone know if a company offers 40 hours of CE online? 20 is the most I can find that DPR approves. I can do the other 20 with another outfit online but sometimes DPR doesnt update their list for approved CE and it would be easier to deal with one company online vs 2 or more. If you go to the DPR site and click on Continuous, Online and Correspondence Classes, you will find some companies that have more hours.